Concussions are the most common form of traumatic brain injury and there are an estimated 3.8 million cases related to sporting activities each year in the US. However, this is likely an underestimate because as many as 50% of concussions are thought to go unreported. Often referred to as mild traumatic brain injury (mTBI), concussions are generally caused by severe rotational or accelerative forces on the brain, which overcome the cushioning properties of the cerebrospinal fluid and result in an impact between the brain and skull. Concussion causes a variety of physical, cognitive, and emotional symptoms, which may not always be recognized if subtle. Post-concussion symptoms often include headaches, foggy thinking, emotional reactivity, irritability, anxiety, cognitive impairment and sleep disturbances. Concussion treatment typically involves physical and cognitive rest (reduction of activities such as school and work) and although symptoms usually resolve within three weeks, issues can persist for extended periods for many individuals. The need for extended recovery from concussions appears to be more prevalent in adolescent populations due to the increased compliance of the pediatric skull and the potential for greater inflammatory response in younger individuals. 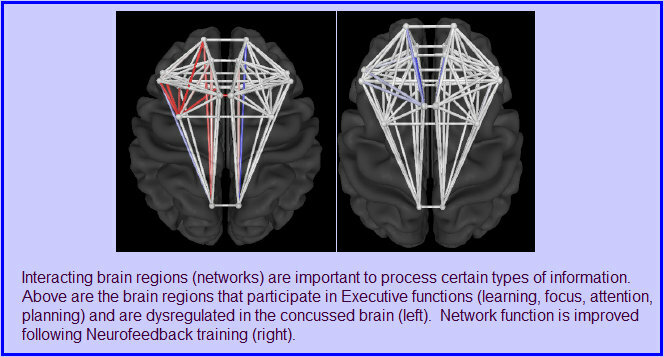 While the effects of concussions on the patterns of brain-wave activity (EEG) are not fully understood, it is clear that, in many cases, mTBI is associated with a focal increase in slow wave power (Delta or Theta), often within the temporal lobes. Additionally, changes involving generalized elevations in the Beta bandwidth and connectivity abnormalities are common. However, concussions are not a local event, and the effects of injury can involve many brain regions, regardless of where the impact occurred. Neurofeedback training at Dill-Standiford Psychological is a safe and effective tool to help improve cognitive and emotional function for those suffering the lasting effects of mild traumatic brain injuries.